Ficus plants-Life is a Garden. Ficus plants are amongst the most popular foliage plants for indoor containers. Whilst there are hundreds of different species, there are only a few prized for their lush green foliage and successful growth indoors. Ficus nitida is one of these. As trends globally continue to feature and include plants and foliage – the use of indoor plants is growing. Although most Ficus will grow into huge trees in the open and in frost free areas, they adapt very well to growing in containers, both indoors and out. They are ideally suited to smaller homes and townhouses, with limited space, contained gardens and patios. Individual pots make a stylish feature, whereas a row of plants or hedged plants offer the practicality in the form of screening, both visually and for sound! Ficus trees maintain their tree-like shape regardless of size. They are excellent container plants that add an instant feature, whether small, medium or large; to homes, offices & patios. In recent years, imaginative nurserymen have taken advantage of Ficus’ pliable trunk and you can now select from standard, braided and twisted forms which continue to grow in demand and popularity. Ficus are fast growing, with a rapidly spreading roots. 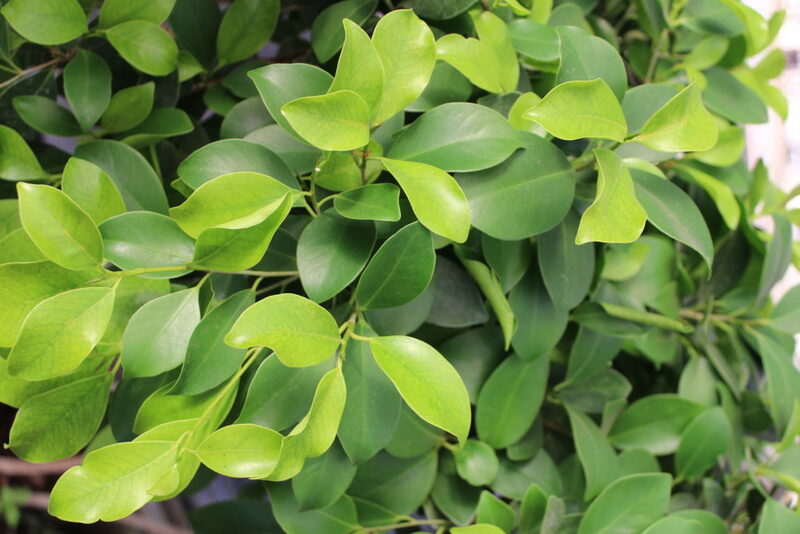 Their growth is contained by the size of their container, but one should take care when growing Ficus outdoors… Some varieties may be invasive in certain areas and it is advisable to check with your local GCA for advice. Position: Ficus need a high light location indoors. They are sensitive to draughts and should be positioned in a sheltered, shady position. Plants thrive on patios, if kept away from draughts.